This article will aid you to remove FileFrozr ransomware effectively. Follow the ransomware removal instructions at the bottom of the article. 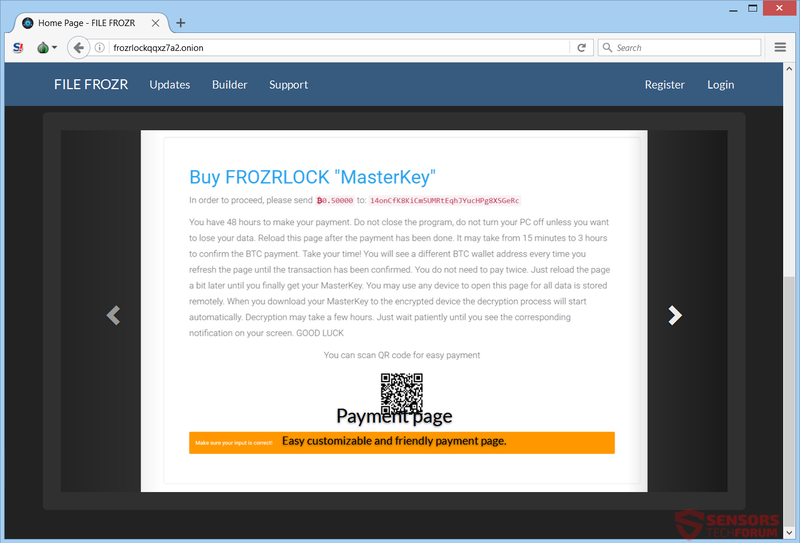 FileFrozr ransomware is a RaaS (Ransomware as a Service) that is being offered for the price of 0.09 Bitcoins or 100 US dollars. The service offers a discount and will receive an update soon, so live versions could begin to spread fast. If you get infected, your files will become encrypted and receive an extension, which the buyer has set. Files with around 250 different extensions will get encrypted. Read the article through and see what ways you can try out to potentially restore some of your data. Short Description The ransomware is put on the Internet as a service (RaaS). It is offered for 0.09 Bitcoin or 100 US dollars. Symptoms The ransomware will encrypt your files and will place an extension to all files after the encryption is completed. User Experience Join Our Forum to Discuss FileFrozr. FILE FROZR is a great security tool that encrypts most of your files in several minutes. Fast, stable, and affordable crypto-locker. Auto-buy, low price, undetectable load while working, TOR support, 250+ extensions, unmatched support, multithreaded, online builder, server side obfuscation. Bypass BitDefender and Malwarebytes Anti-Ransomware. Encrypts user data using safe implemented AES-256 and RSA-4096, each file encrypts with it own unique key. 50$ Discount on sales start! The FileFrozr ransomware could also get delivered through social media networks and file-sharing services. Freeware programs found on the Web could be promoted as useful but still contain the downloader for the payload of the ransomware. Don’t open files when you download them, before scanning them with a security tool beforehand. That goes especially for files, which come from a suspicious source, like an e-mail with an unknown origin. You should check their size and signatures for anything that seems unusual, as well. Also, give the ransomware prevention tips a read to see how you can avoid future infections. FILE FROZR is coded from startch in C#, no public sources were used. This makes FILE FROZR fully undetectable. Tested with Bitdefender Anti-Ransomware and MalwareBytes Antiransomeware. All builds are obfuscated at our servers. This prevrents original sources from being detected. Unlimited rebuilds, low price, panel with built in payment processor, AES256, RSA4096, and unique keys randomly generated for each file guaranting super strong security of files. Builds are obfuscated and crypted at our servers, no aditional crypting etc. required. Panel using trusted Bitcoin processor so there is no need to set vps with BitcoinID. TOR support and low value of transfering data makes panel totally anonymous. 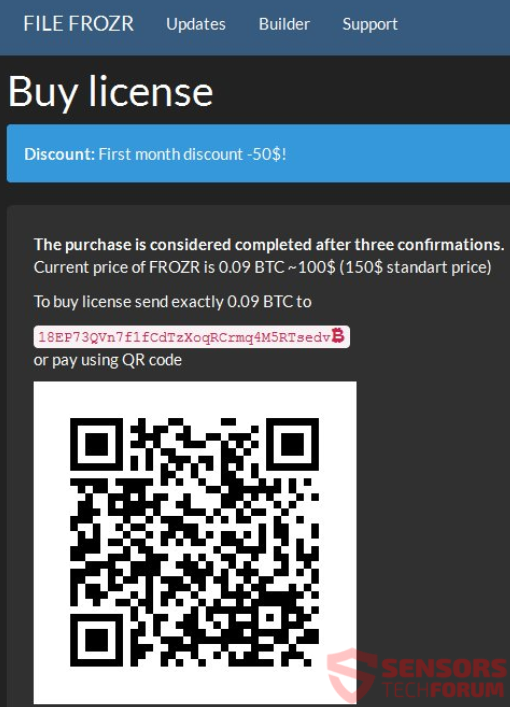 The FileFrozr ransomware virus uses BitCoin and the TOR service for keeping its creator anonymous and hidden on the Web. 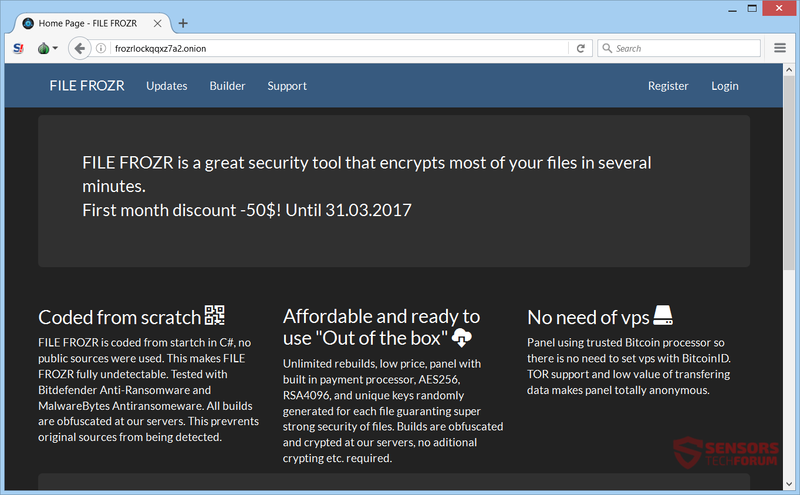 The FileFrozr ransomware cryptovirus searches to encrypt files with more than 250 different extensions. More file extensions are quite possible to be added, depending on what files, cybercriminals wish to encrypt. The encryption process uses the AES encryption algorithm with 256-bit ciphers and RSA with 4096-bit ones. In a pending update, the cryptovirus will have a feature for offline mode, meaning that internet connection won’t be required for the malware to encrypt your data. Read on through and see what types of ways you can try to potentially recover some of your data. If your computer got infected with the FileFrozr ransomware virus, you should have a bit of experience in removing malware. You should get rid of this ransomware as quickly as possible before it can have the chance to spread further and infect other computers. You should remove the ransomware and follow the step-by-step instructions guide provided below. Threats such as FileFrozr may be persistent. They tend to re-appear if not fully deleted. A malware removal tool like Combo Cleaner will help you to remove malicious programs, saving you the time and the struggle of tracking down numerous malicious files. Threats such as FileFrozr may be persistent on your system. They tend to re-appear if not fully deleted. A malware removal tool like SpyHunter will help you to remove malicious programs, saving you the time and the struggle of tracking down numerous malicious files. Note! Your computer system may be affected by FileFrozr and other threats. 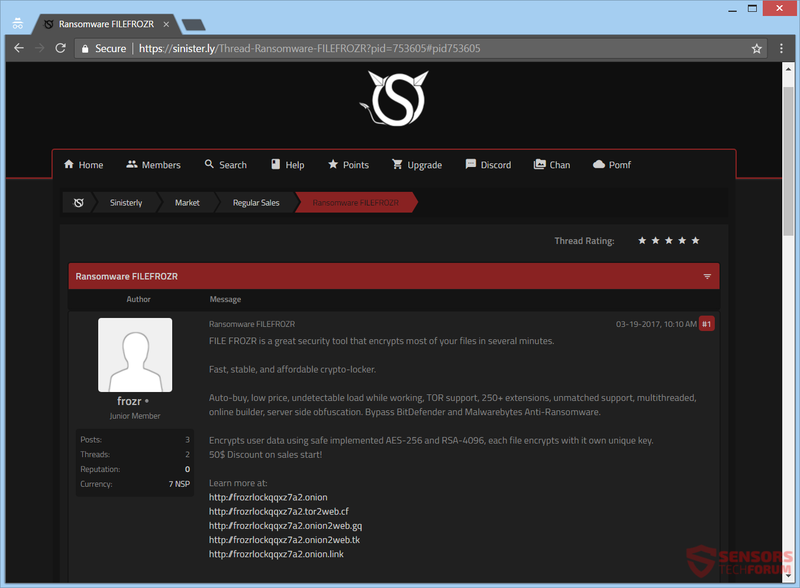 SpyHunter is a powerful malware removal tool designed to help users with in-depth system security analysis, detection and removal of threats such as FileFrozr. 1. Install SpyHunter to scan for FileFrozr and remove them. 2. Scan with SpyHunter, Detect and Remove FileFrozr. Ransomware infections and FileFrozr aim to encrypt your files using an encryption algorithm which may be very difficult to decrypt. This is why we have suggested several alternative methods that may help you go around direct decryption and try to restore your files. Bear in mind that these methods may not be 100% effective but may also help you a little or a lot in different situations. Note! Your computer system may be affected by FileFrozr or other threats. Fix registry entries created by FileFrozr on your PC. Combo Cleaner is a powerful malware removal tool designed to help users with in-depth system security analysis, detection and removal of threats such as FileFrozr. Step 5: In the Applications menu, look for any suspicious app or an app with a name, similar or identical to FileFrozr. If you find it, right-click on the app and select “Move to Trash”. Step 6: Select Accounts, after which click on the Login Items preference. Your Mac will then show you a list of items that start automatically when you log in. Look for any suspicious apps identical or similar to FileFrozr. Check the app you want to stop from running automatically and then select on the Minus (“–“) icon to hide it. A pop-up window will appear asking for confirmation to uninstall the extension. Select ‘Uninstall’ again, and the FileFrozr will be removed. When you are facing problems on your Mac as a result of unwanted scripts and programs such as FileFrozr, the recommended way of eliminating the threat is by using an anti-malware program. Combo Cleaner offers advanced security features along with other modules that will improve your Mac’s security and protect it in the future. Hey !, I found this information for you: "FileFrozr Ransomware (RaaS) – Remove and Restore Your Files". Here is the website link: https://sensorstechforum.com/filefrozr-ransomware-raas-remove-restore-files/. Thank you.